Genre fans will hardly be surprised to learn the wife of Jonathan Harker and the daughter of Abe Helsing is suffering from strange dreams and hallucinations. However, the figure taking hold of her subconscious is a Bohemian Brazilian woman rather than a tall dark Transylvanian gent. 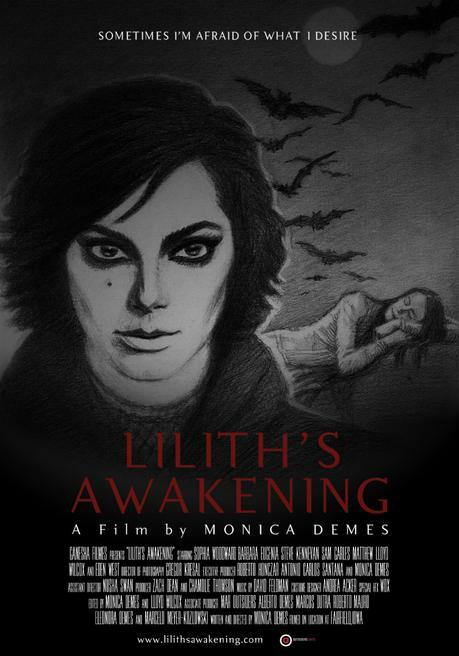 The visions are disturbing, but it is unclear whether the archetypal entity wishes to destroy Lucy or liberate her (or both or neither) in Brazilian filmmaker Monica Demes’ English language feature film debut, Lilith’s Awakening (trailer here), which premiered at the 2016 Dances with Films. Married to the cloddish Harker and still working the cash register for her mechanic father, Lucy remains unfulfilled in pretty much every way. She has been carrying on an affair with one of Helsing’s employees, more out of boredom than passion. Frankly, Arthur’s violent streak would be problematic, but at least it breaks up the monotony of life. Unfortunately, when Lucy stands up her pseudo-paramour, he picks up the hitchhiking Lilith in her place. You could say Lilith is the woman of Lucy’s dreams (or nightmares), who makes short work of horny Arthur. He wasn’t much, but Arthur’s absence rattles Lucy. To make matters worse, she starts to lose time and experience waking dreams that make it difficult to distinguish fantasy from reality. Than Demes really takes a turn onto Mulholland Drive or Lost Highway, which is rather appropriate, since she was mentored by David Lynch. Sometimes the austerely arty approach to horror motifs works, as in Ana Lily Amirpour’s A Girl Walks Home Alone at Night (not a bad comp film for Lilith) and sometimes it falls flat as a pancake yet inexplicably wins the audience award at Tribeca (go figure). Happily, Lilith works rather well because of the way Demes instinctively balances the elements (including some gore) with the mind-games and the gender politics. Like Amirpour’s film, Lilith is an arresting looking film, shot in perversely gorgeous black-and-white by cinematographers Alfonzo James and Gregor Kresal. Together with Demes, they frame some wonderfully eerie off-kilter images. Unfortunately for the cast, Demes’ style has a distancing effect, but MPB-influenced Brazilian rocker Bárbara Eugênia has the perfectly uncanny and seductive screen presence to withstand and stand-out. As Lucy, poor Sophia Woodward is sort of stuck serving as Demes’ angst marionette, but at least Steve Kennevan adds some saltiness as old Abe. Lilith could also be likened to the Argentine She Wolf, but Demes’ film is actually more grounded and polished. It is aesthetically ambitious, especially by genre standards, but she largely pulls it off. Recommended for adventurous cult film fans, Lilith's Awakening is sure to have a long festival life thanks to Lynch’s god-fathering, following its world premiere at this year’s Dances with Films.